I was able to get away from work after lunch on Friday and get down to BayCon by around 1 PM. I was very concerned about parking the Rolling Stone because the supply of surface parking there is quite limited, and of course I can't park that boat in the parking garage. To my delight, I found a deep corner space available and no parking lot traffic, giving me the time it takes to gently back in. 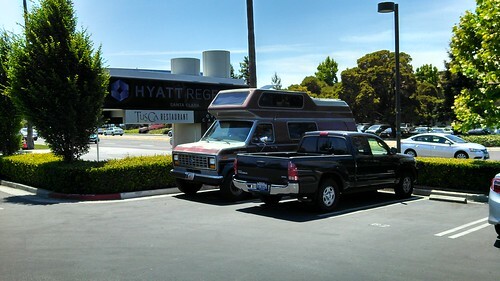 Not only was there enough space here for the 20-foot-long RV, but it's very convenient to the front of the hotel, unlike the garage spaces, which require walking clear around the hotel, particularly after 7 PM when they close off the side door. I won't be moving the vehicle again until I leave on Monday. Heading inside, I went up to the fan tables on the mezzanine, where I delivered Portland in 2016 Westercon bid fliers to Lea Rush, chair of Portland's bid (she'd flown down that morning; I printed fliers for her locally so she wouldn't have to lug them around) as well as some 2016 Westercon Site Selection ballots (just released this week) and put Montreal in 2017 Worldcon bid fliers out on the flyer table. I found that my hotel room was ready, so I checked in and moved my stuff from the RV to the hotel room. (With the RV, I don't have to pack quite as compactly as when I'm traveling in the Astro; for example, there's a closet in the Rolling Stone in which to hang my shirts rather than having to bag them up in luggage.) 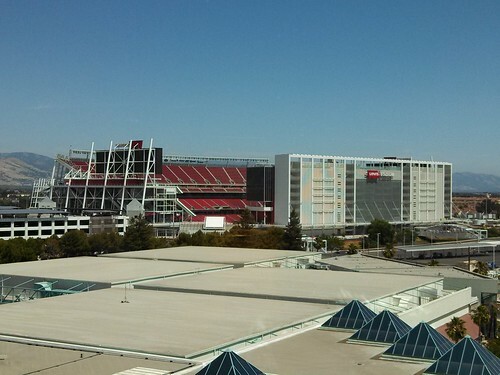 There's a nice view of the new home of the San Francisco 49ers, Levi's Stadium, from my hotel room window. I reckon the best way to actually get to see a game in this stadium would be to stay at this hotel the night before and walk to the game rather than try to brave what promises to be absurdly bad traffic to and from the game. I went to check out the Dealer's Room, where I ran in to BayCon's Fan Guest of Honor, Sally Woehrle. I made the "I'm not worthy" bow, and she started to make it back to me, saying something about my past Worldcon Chair status, and I said, "Forget that: as Fan Guest of Honor, you have brevet rank over me for the duration of the convention. You don't get to become a Respected Elder Statesman of Fandom until after your Worldcon is over." As we chatted, Warren Buff, out to BayCon to promote the DC in 2017 Worldcon Bid, joined us, and the three of us repaired to the bar for a round of smoffing, about which more later. The DC2017 bid is the only one represented here (aside from the Montreal fliers I brought). Lisa and I could conceivably have run a Montreal bid table, but with my current work stress and Lisa's dental/tinnitus issues, we have too much going on in our lives to do so right now. After our smof session, I went to check on Lea Rush, who was happy to have sold a handful of Portland bid pre-supports including a Friend of the Bid, but who was also looking very faded out, having been up since 3 AM to get her flight down from Portland. At my suggestion, she closed her table and after she returned from stowing her things in her room, I showed her where the pod of fast food, including a Togo's, is located a short distance north of the hotel. After we returned, she headed back to her room to eat and maybe rest from her travel. After my late lunch, I returned to the Dealers Room, started a pile of books with Cargo Cult, and was talking trains with Scott Dennis when my phone rang. It was Lisa, who had made absurdly good time driving down from Fernley against the flow of getaway day traffic and was here about two hours earlier than I expected. We unloaded her things from the van and went off to dinner. Later, after dinner, I called Lea Rush and (based on an earlier conversation) offered to take her to Trader Joe's for something they had that she wanted. Also, thanks to the hotel rooms here having mini-fridges, she was able to lay in some supplies, as were we. Lisa and I did a brief troll of the Party Floor, but both of us were tired and we retired early. Having no commitments on Saturday of BayCon, we were able to sleep in. I guess I was tired. I slept for more than ten hours. It's rather strange to me to have almost no time-specific commitments at a convention. I hardly know what to do with myself. But OTOH, I've been working so hard that having the weekend at a nice hotel where I don't have to work myself to death and can sort of relax is a Really Nice Thing.